A 3-ounce serving of cooked cod is an excellent source of protein and essential nutrients, such as vitamin B-12 and selenium. While low in saturated fat and cholesterol, cod is rich in the omega-3 fatty acids that may help lower your risk of heart disease. 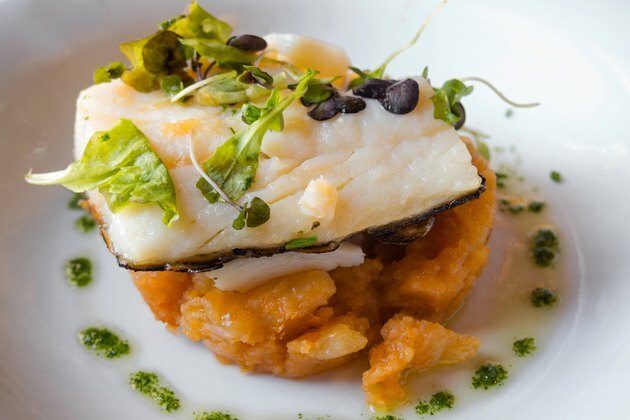 When fresh cod is not available, frozen cod is an economical and versatile alternative. Whole frozen cod needs to be completely thawed before cooking, but frozen cod fillets can be prepared in a variety of ways without defrosting. Remove the number of frozen cod fillets you plan to use from their packaging. Return any unused fillets promptly to the freezer, ensuring that they are in an airtight bag or container. Position your faucet to run the coldest possible water. Rinse each fillet briefly under the water, until the surface glaze of ice is gone. Pat each fillet dry with paper towels. Set the fish aside. Coat the dull side of a large square of aluminum foil lightly with nonstick cooking spray. Place the frozen fillet in the center, skin-side down. Use a pastry brush to spread vegetable oil on both sides of the fillet. Fold up the sides of the foil to form a sealed packet around the fish. Place the packet on a grill heated to 400 degrees Fahrenheit. Allow the fish to cook for eight to 10 minutes. Use a metal spatula to remove the packet from the grill. Open the foil, add seasonings to the surface of the fish and reseal the packet. Put the fish back on the grill. Continue to cook for eight to 10 more minutes. Fill a large saucepan or stockpot with approximately 1 inch of liquid, choosing from water, broth, 100 percent fruit juice or a combination of liquids. Bring the liquid to a boil over high heat. Line a steamer insert with thin-cut vegetables, such as wide lettuce leaves or sliced onions. Place the insert into the stockpot and lay the frozen cod fillet onto the vegetables. Put the lid loosely in place. Steam the fish for five to seven minutes. Use a spatula to gently remove the cooked fish. Spray a baking dish lightly with nonstick cooking spray. Place the prepared frozen cod into the center of the dish. Coat each side of the fillets with a thin film of your favorite vegetable oil. Roast the frozen cod for four minutes at 450 degrees Fahrenheit. Sprinkle the fish with seasonings, such as salt, pepper, herbs, spices, sauce or lemon juice, if desired. Return the dish to the oven. Continue to roast until the fish is done, about 12 to 15 additional minutes. Spray a broiler pan with nonstick cooking spray. Place the frozen cod fillets onto the pan. Brush each side of the fillets with vegetable oil. Place the pan under a broiler that has been preheated to 450 degrees Fahrenheit. Broil the fish for four minutes. Remove the broiler pan. Sprinkle the fish with seasonings. Put the pan back under the broiler. Cook the fish until done, about eight to 11 more minutes. Cod is done when it flakes easily with a fork and the flesh appears opaque. To be certain it's thoroughly cooked, use an instant-read thermometer to determine that the internal temperature has reached 145 degrees Fahrenheit. If you prefer to thaw cod before cooking it, place it in the refrigerator overnight or put it in a sealed zip-top bag and immerse it in cold water. You may thaw fish in the microwave, but the texture may suffer. Young children and pregnant women should limit themselves to 12 ounces of fish such as cod each week.